Imagine, if you will, the excitement of winning the lottery, or a group of 10yo girls being told that One Direction were coming to tea and giving a personal performance. 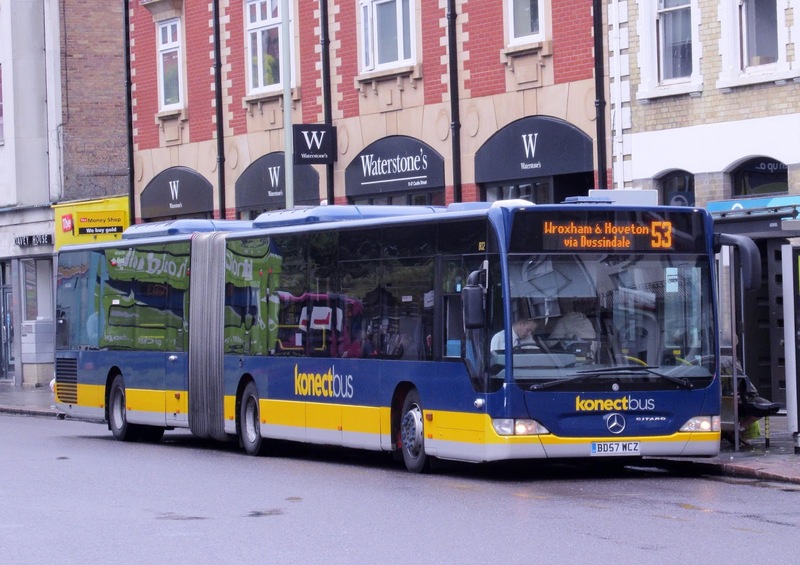 That, I assure you is nothing compared to the excitement flowing through my Twitter message inbox today, as Konect bendibus 802 put on a spectacular display of route rareness in front of the lens of Cameron Robinson, going out on the 6X, 53 and 2. Christmas truly had come early. Occasionally a bendi has appeared on the 8, even a P&R apart from the 604, but the trio of routes it appeared on are extremely rare, and I cannot remember one ever appearing on the 53's before. Well done Cameron for being in the right place at the right time and for sending me these superb pictures. I hope your heart rate has settled back down now! 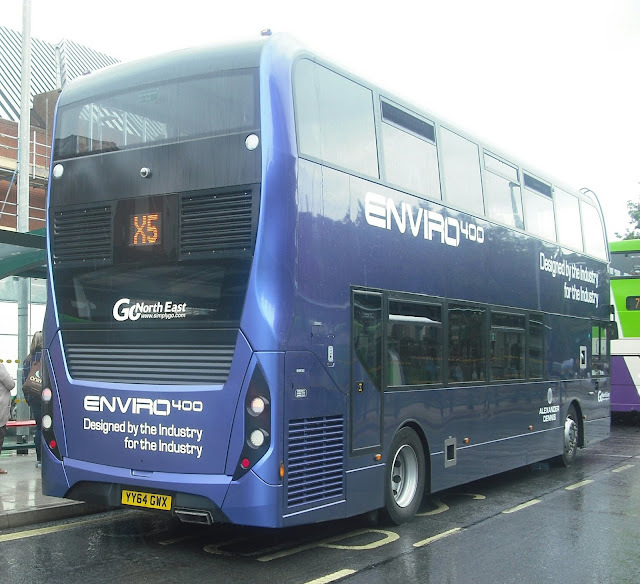 In the meantime I was in Ipswich to photograph the E400 MMC demonstrator on loan to Ipswich Buses for the week. YY64 GWX is the same vehicle Coach Services had in March, and then I wasn't exactly bowled over by it. This time, however, on a trip on the X5 to Ipswich Hospital and back, it felt a bit better, firmer, and didn't rattle as much. Maybe it's because I was on familiar territory, or maybe Go-North East in Gateshead, whose vinyls and legal lettering it carries, have done a bit of work on her. Anyway it is still a photogenic bus! And at Major's Corner in slightly better weather! Chris Jenkinson has been in touch with the latest news and pictures of the former Norfolk Green Irisbus Agoralines, now with Nu-Venture in Aylesford, Kent. 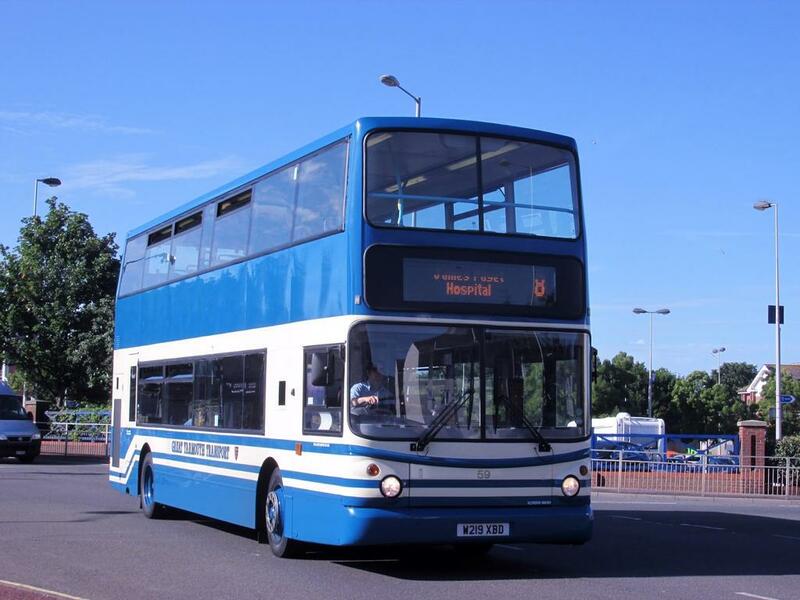 898 holds pride of place on this blog, being the header picture. 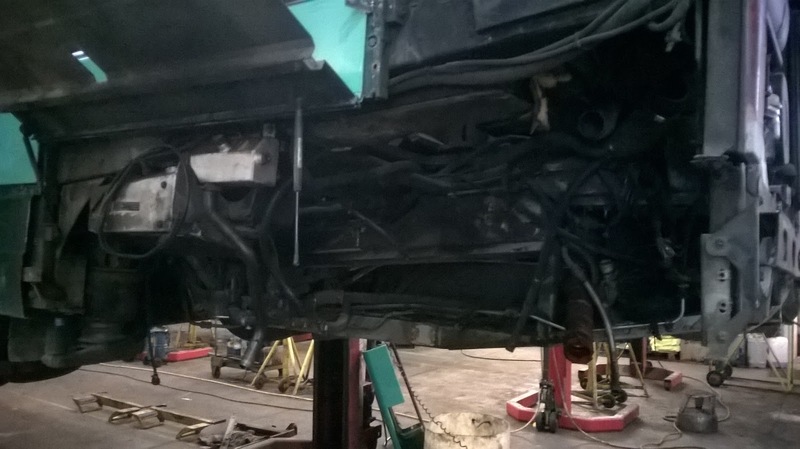 However in recent weeks she has been suffering regular engine probs and it has been decided to give her a transplant from the long term VOR sister 897. 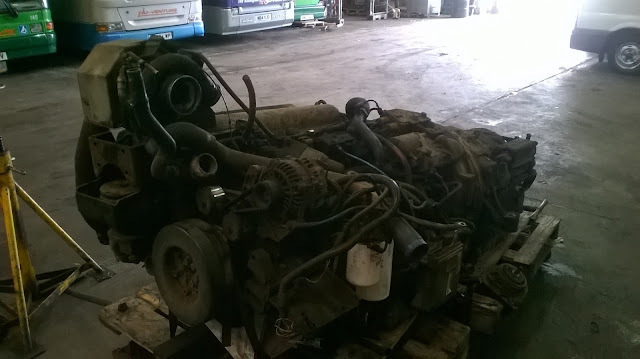 So for the first time in months Chris drove 897 from Nu-Venture's storage facility to the workshop to have her engine removed. This will almost certainly the last journey 897 makes under her own steam. 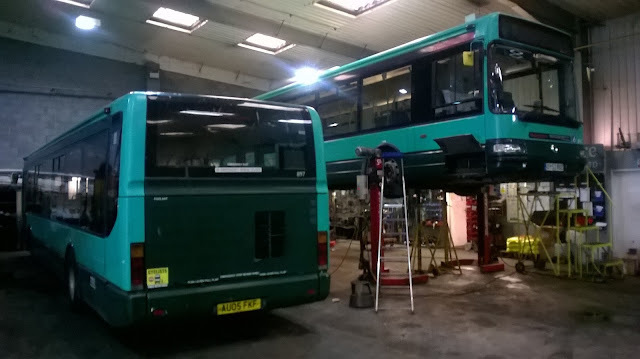 Chris has sent in pics of the process, including a pic of both 897 and 891 side by side in the workshop. 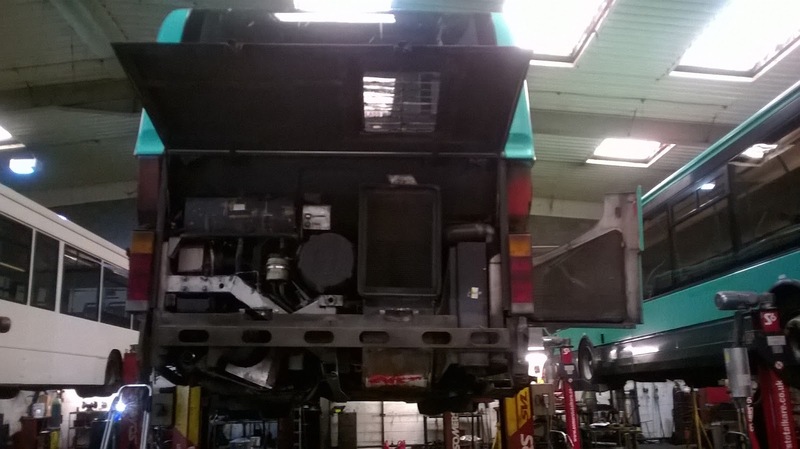 891 was in for MOT. Chris also sent me a picture of another of his own buses, which was brought from storage to the workshop for MOT. M64 VJO is an ex Thames Transit and Stagecoach Dennis Dart and I have to say looks very smart. 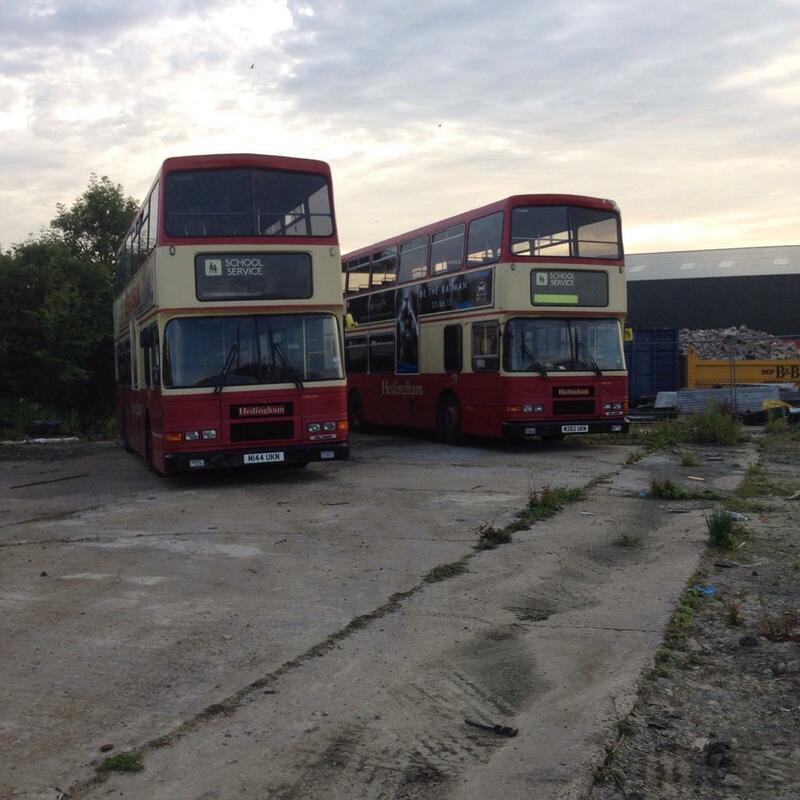 Many thanks for the pics and update, Chris and we are looking forward to the news of a successful operation for 898. What's that you say? Straight-8? Talk in english man!! OK I shall and all will be revealed later. First of all I would like to share with you a picture I received last week but was asked not to use, so I didn't. But now I can, so I will. This was the first pic in (limited) circulation of one of the new E400's for Konect's service 8 between Norwich and Toftwood. Very nice it looks too. My belated thanks to my source at Konect who sent me that. 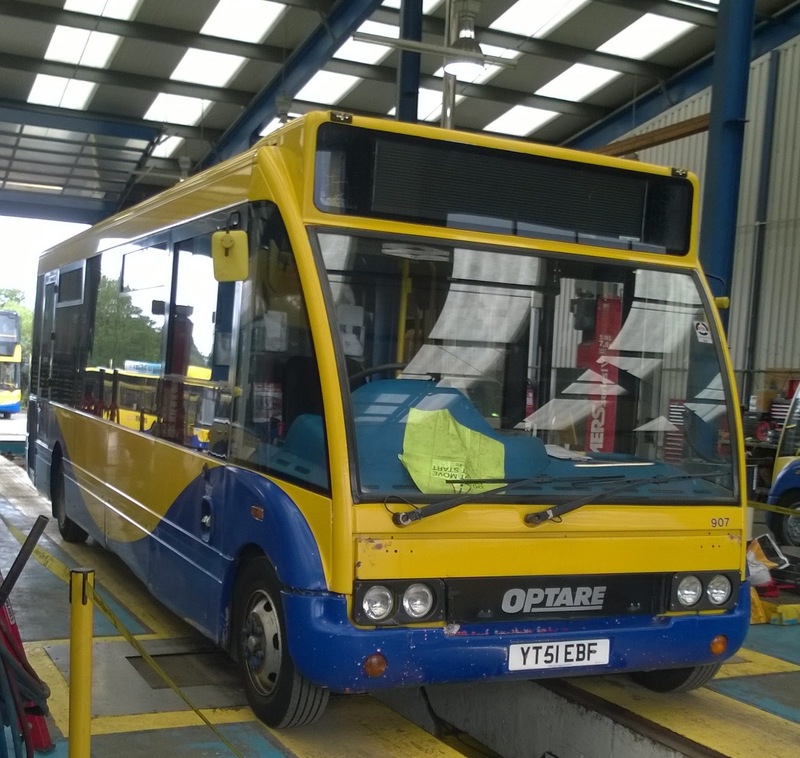 Yesterday I received more pictures this time of the first arrival at Dereham, whch was SK15 HKB. I'll be using the pic of the cab area later. 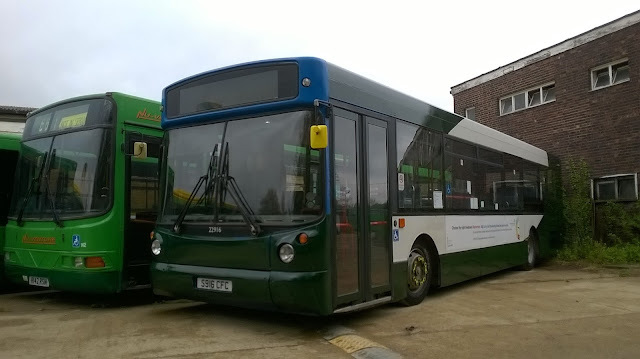 However, I thought I'd better try and see it for myself so today I ventured to Dereham, noting how well the current E400's have lasted on the route, and luck was in as another two had arrived. You don't get anywhere in this world by being shy so I went in to see if I could take a look round and Operations Manager Steve Royal was only too happy to oblige, showing me round himself. Now let's not get too excited here. I'm not and neither are Konect. These are bog standard E400's. Not MMC's, not high spec. However, if the current E400's on the route are anything to go by they will do the job. The interiors are certainly eye-catching. I am impressed in the way customers have been listened to and the recent obsession with leather by everyone has been halted. I like leather headrests, but in the heat leather gets too hot as I found out last week. 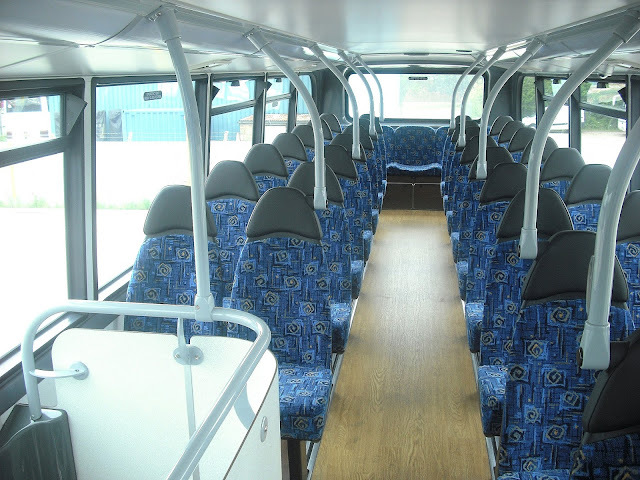 So this combination of fabric seats with leather headrests looks good. The seats are firm but comfortable, and even the traditionally hard seats at the back seem more comfortable than they used to. I like the wooden floor look, although cleaning will have to be top notch to keep them looking good. Steve tells me that the P&R E400's will have identical interiors. 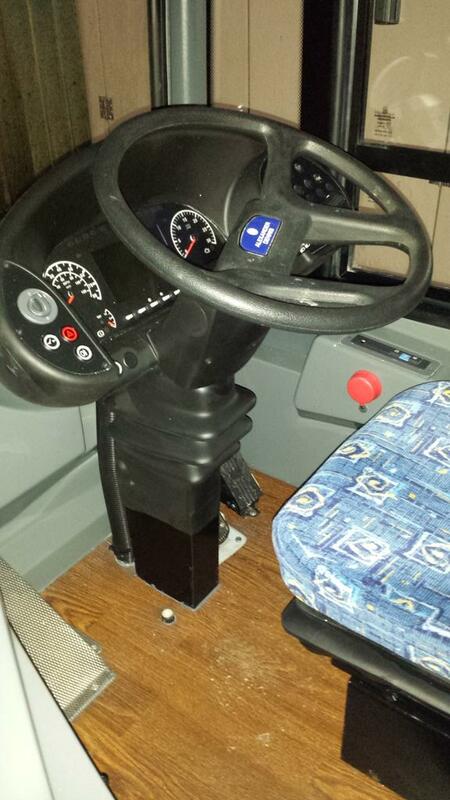 Here is the cab area, pic again supplied by my contact at Konect. I did take a picture of the USB charging sockets but I still only have a 25% screen and it was rubbish! However it will be interesting to see if firstly anyone can find them and secondly how long they last. Any facility, though, is welcome and it's more than anyone else has got. Now to explain the title of the post. Steve told me that instead of having Konect express vinyls applied, the original route name of Straight-8 is going to be resurrected and used again. I like that, and I'm looking forward to seeing the finished articles when they enter service. My thanks to Steve Royal for giving up his time so readily today, and for the open and varied conversation we had. Finally here is another pic that didn't turn out quite right but sod it it's only a missing letter or two! I assure you this is SK15 HKA. 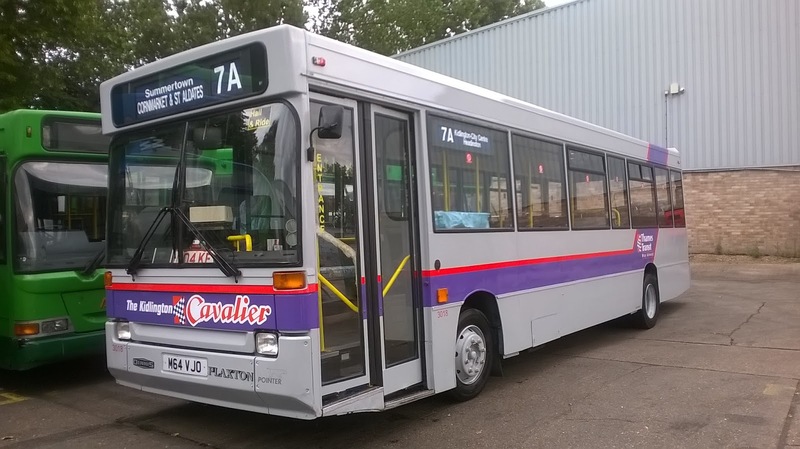 While Konect are getting brand new buses I got home to find an email from my Anglian contact telling me that Anglian have welcomed back a 14yo friend. 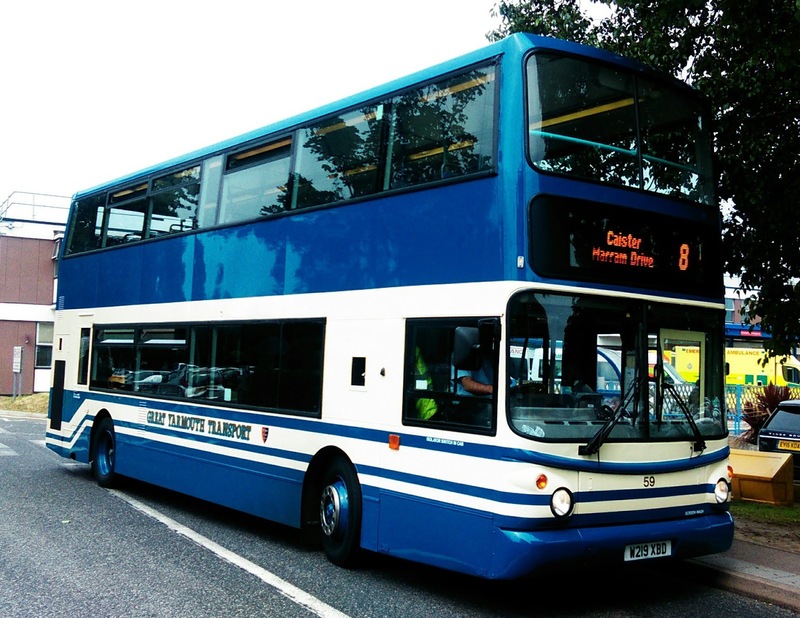 Solo 907 YT51 EBF which was transferred to Chambers a couple of years ago has returned on a permanent basis. 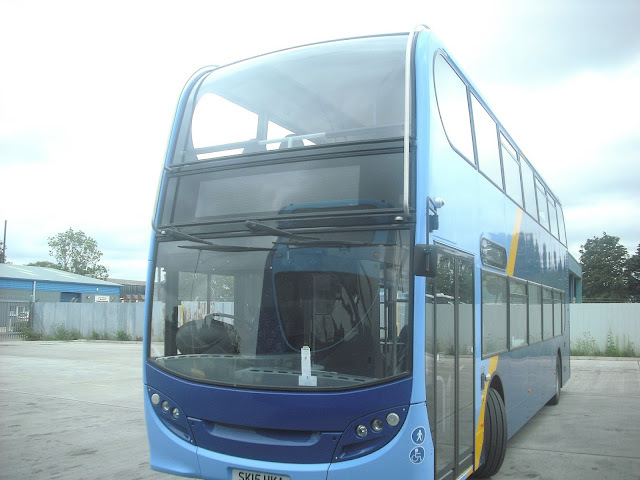 I am making enquiries if this will see the departure of the on loan E200 and as soon as I know I'll let you know. My thanks to my contact at Beccles for the info and pic. With very little happening now until September I'm going to be taking a break from posting for a bit. Of course that's not to say there won't be the odd special, and rest assured if anything major does happen it will be reported. However my crystal ball reveals nothing dramatic for the next couple of weeks at least so a battery re-charge seems sensible. I'll still be around, however, so hope to see some of you out and about. This morning saw the exodus of thousands of festival goers from Latitude, which took place in Henham Park over the weekend. 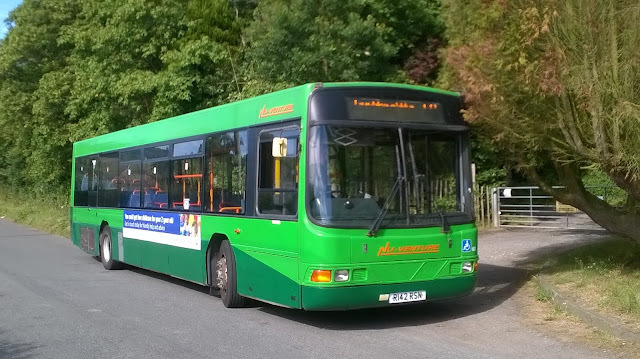 Getting the hoards to and from the park requires great planning, and Andrew Pursey of BorderBus was the man charged with that task. One of the main cogs in the transport wheel was the Diss Station to Latitude coach link, which involves operators from across the region. This morning I stationed myself in Bungay to get pics of some of the coaches being used. Some of these pics are not perfect as my camera has decided to reduce my screen to the top right quarter only, so judging is a little difficult. A new camera will be acquired asap. Another company with multiple coaches in use was Belle Coaches. They had a trio of Setras in action, two of them running together. 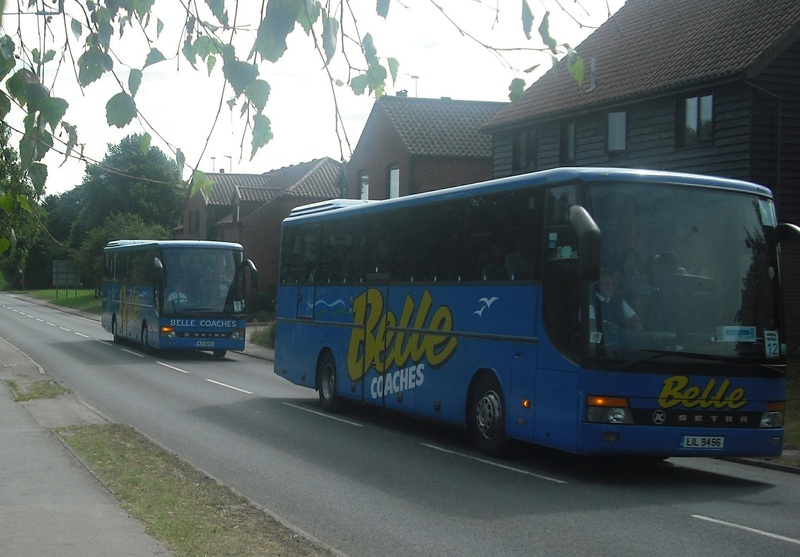 Coach Services of Thetford were also in evidence. 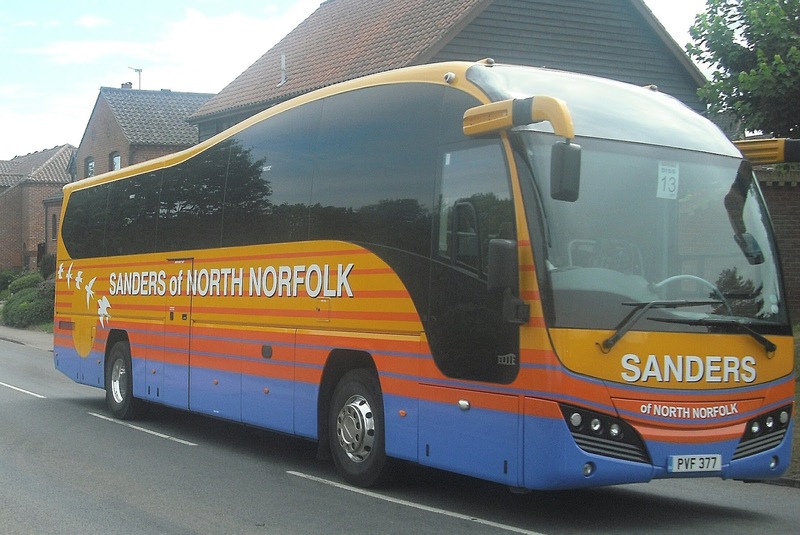 At this point I must apologise to Lamberts Coaches whose Van Hool Volvo B10M I made a complete mess off so we conclude with Sanders, who provided the best looking coach on view today. 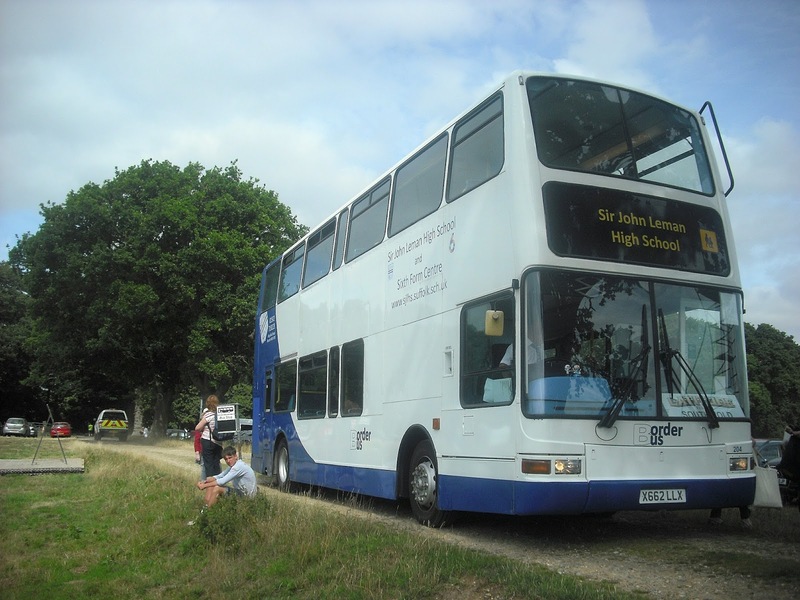 No not ths one but Van Hool bodied VDL SB4000 538 FN (ex East Kent reg) doesn't look bad. This one! 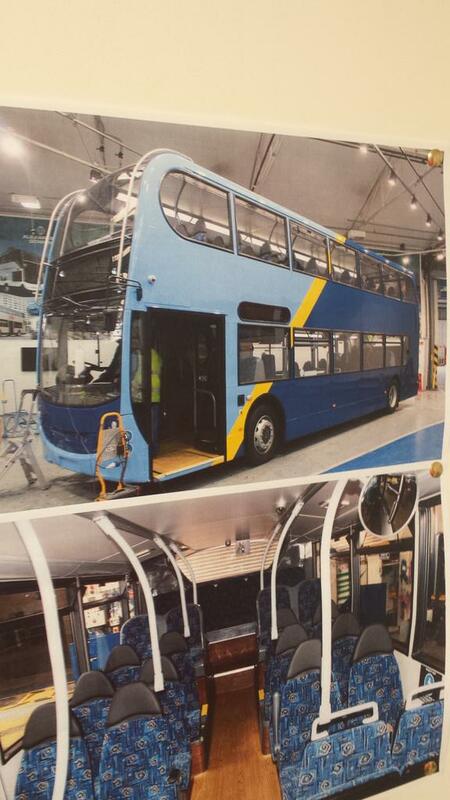 Plaxton Elite bodied Volvo B9R PVF 377 is surely the best in show! Nearly made a mess of it! I think congratulations are in order to Andrew Pursey for once again superbly organising and scheduling the Latitude buses. I have heard no adverse comments whatsoever, and roll on next year! Another big post to keep you entertained and we start with Latitude. On Friday Latitude started in earnest, although the queue on the A12 northbound Thursday took seeing to be believed, and as usual the many bus and coach links were in operation. 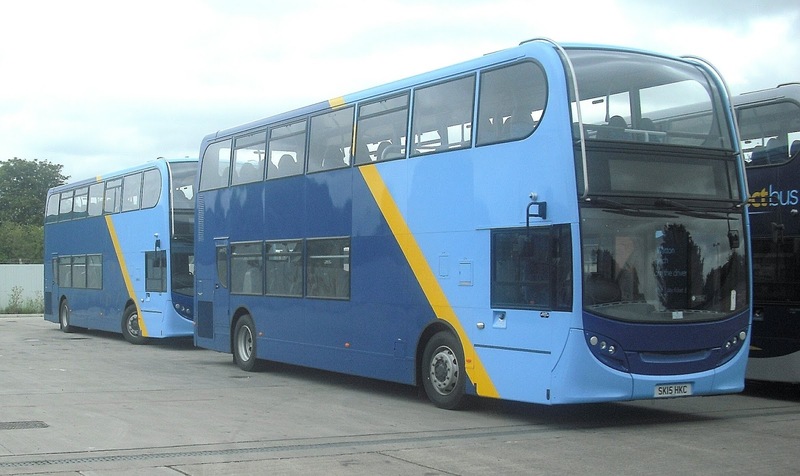 As last year BorderBus are in overall control of everything, with much hiring of other coaches necessary. 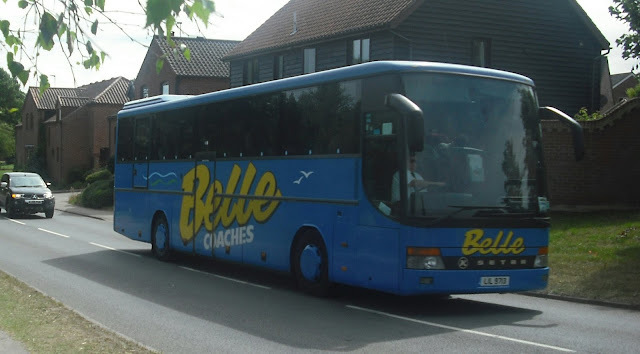 The intention was to get both local shuttles and coach transfers covered on Friday, but not having the whole day to spare I soon realised this would prove inpossible so I'll be doing the coaches on Monday when they return everyone to Diss station from a secret location en route. (That means I haven't decided where yet). 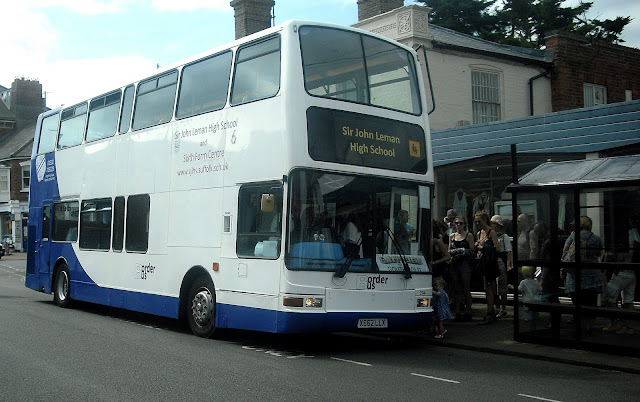 So on Friday I settled for a few trips on the Southwold Shuttle, particularly as it gave me the rare opportunity to travel on one of BorderBus's Plaxton President B7tl's, normally used exclusively on Sir John Leman School work. So after arriving in Southwold on Anglian ex Metrobus Scania 555, which is STILL suffering from the air leak on the door lock I reported on its first day in service some months ago, I linked up with the legend that is Malcolm on the Southwold to Latitude Shuttle, surprised at just how many people were waiting for it that early. When we got to the Latitude day drop off point I was pleasantly surprised to see that there was a period of what can only be described as off roading on a farm track. Not something you get to do everyday! Unless you're a farmer. 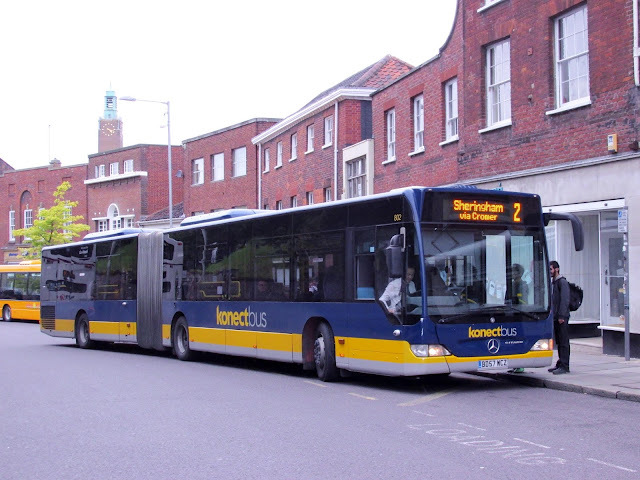 There was also another B7tl doing the internal shuttle, but being the observant enthusiast I am I didn't take a note of which one it was! Update - it's 203! 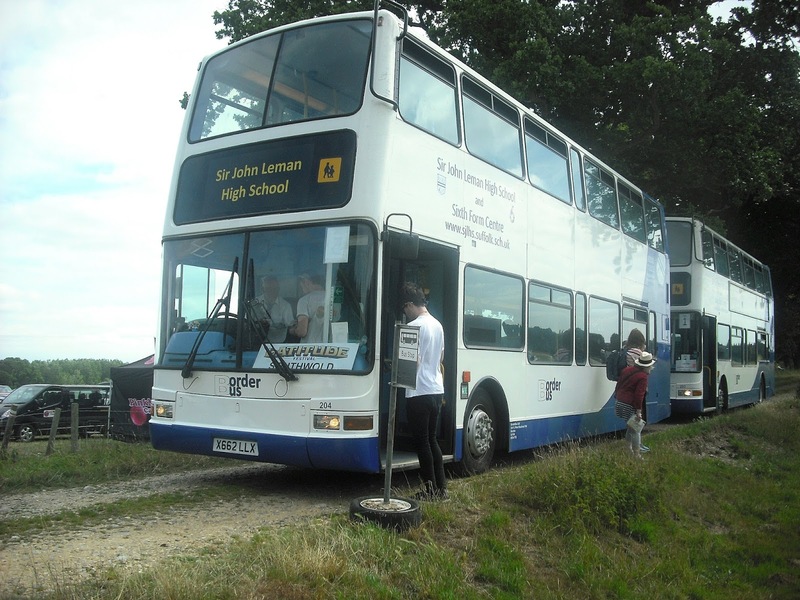 It's always nice to do something a bit different and not only was the route and bus different but so were the passengers wth no buggies or shopping trolleys blocking everything up and everyone out to have a good time. I also had a good time and thanks to Malcolm and BorderBus for letting me hang out for a couple of hours. So on to Saturday and my weekly report from Camera Robinson who was in Norwich catching up with the latest returnee from Rotherham. Turquoise President 32100 was already, well turquoise but has been refurbished with leather seating and is the first of the route branded buses to have had the rear route colour painted out and replaced by the generic First Purple. 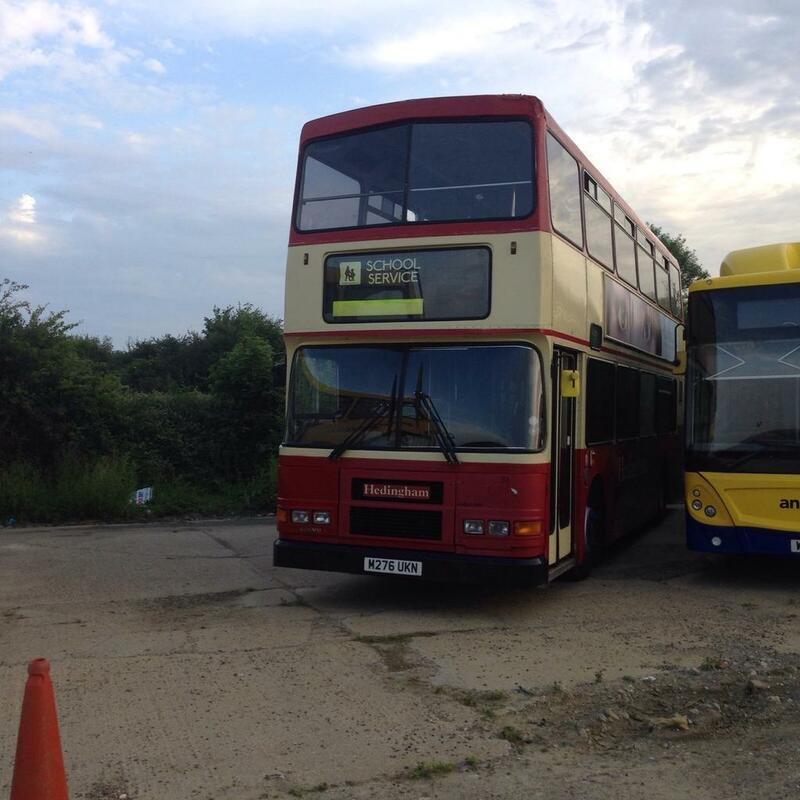 B7tl 32203 and Trident 33167 are currently up in Rotherham having the same treatment. Cameron assures me that the seats are really comfortable. However since Cameron also thought the previous seats were really comfortable I will endeavor to get on her in the coming week to test them out for myself! 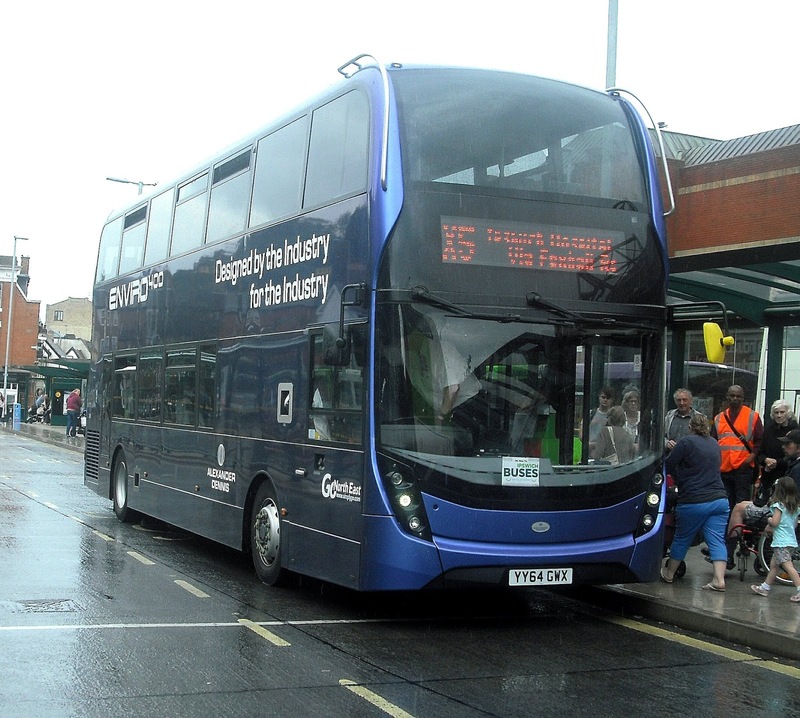 Also in Norwich today was the third different open top vehicle to operate the Norwich Tour this Summer. After regular Olympian G520 VBB suffered mechanical probs yesterday Ensignbus came to the rescue and sent up another Olympian, this time Alexander bodied Olympian P493 MBY. Cameron got this pic of her in Norwich Bus Station. He also informs me that Coach Services President X457 EGK will be converted to open top and taking over the service at some point to comply with DDA requirements. As usual my thanks to Cameron for sending me pics and reports when I'm unable to get out myself. Another invaluable contributor is Davd Green of Galloways. 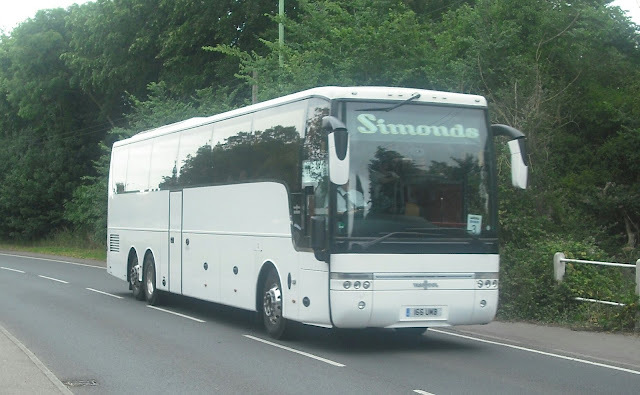 David has informed me that Galloway have taken delivery of a new coach for National Express work to replace the coach which suffered fire damage some months ago. There is some confusion as to which type of Volvo it is. Davd has been told B8R but believes it to be a B11R, which sounds more feasible. What is not in doubt is the registration, which is BF15 AJX. It has a Caetano Cutlass body (not Levante David?) but as yet hasn't been allocated a fleet number. Many thanks for the info, David. Finally I arrived at Southwold on Friday just in time to see this rather smart coach leave. 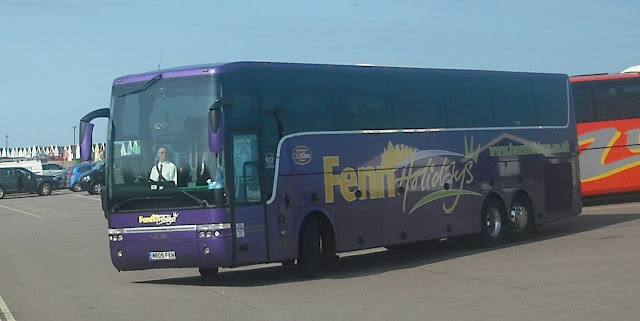 Fenn Holidays Van Hool T917 MR09 FEN appears to be the newest coach in the March company's fleet, new appropriately in March 2009 and certainly looked good in the Southwold sun. Thought that would get your attention! 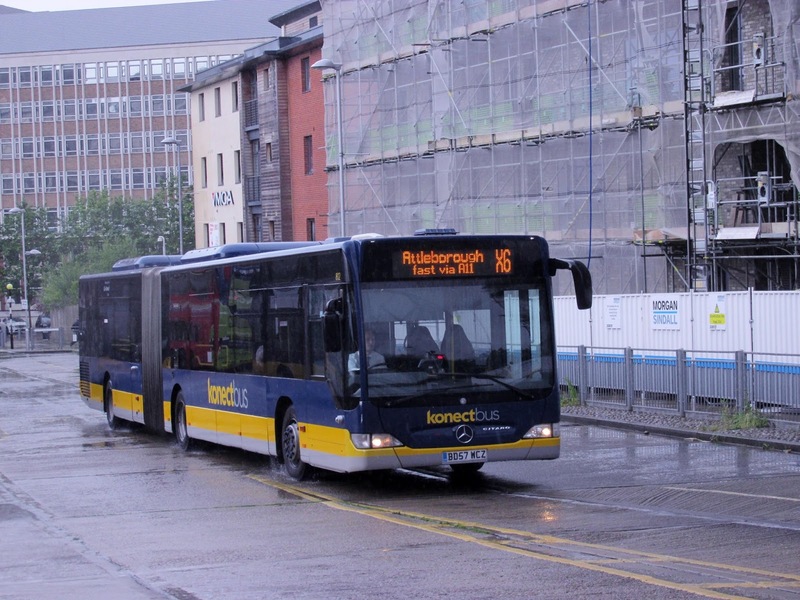 It's true - the X1 is to be scrapped - the X1 in Ipswich that is. More VOSA activity today with Ipswich Buses, First Ipswich and Norwch, Carters and Borderbus all making registrations on VOSA, as listed below. More will be published as and when they are registered. I was having a light hearted banter exchange with an old friend (9 months older to be precise) last night about the use of heritage liveries. He said it was living in the past, I said it was remembering when buses were a far greater lifeblood to society than they are now. He then said something I found quite surprising - that "the service was pretty poor in NBC days despite what we might remember". So was it? I have memories of 7 day services starting earlier and finishing later, of longer routes linking more places, of tickets accepted by all, drivers not having to hide behind plastic, conductors helping people on and off, OAP special buses and being able to leave my village in Kent at 7am, travel all around the South East returning at 10pm with easy to understand timetables. Yes there were cancellations and problems in snow etc just as there are now as most of the caveats and unavoidable circumstances today were applicable then too. So what do you think? Was it better then or now? Was NBC the glory days of buses or do I have seriously rose tinted specs on? Let's have a decent discussion on this. Apologies to younger readers who weren't around during NBC times to compare but ask your parents! Also apologies if there are any offensive comments - I'll be keeping a close eye and will be deleting any as soon as I see them but refuse to restrict comments because of one or two idiots. As promised there have been more registrations on VOSA today from First, Konect, and Stagecoach Norfolk. Here they are. Details of the changes will be published as soon as they become available. 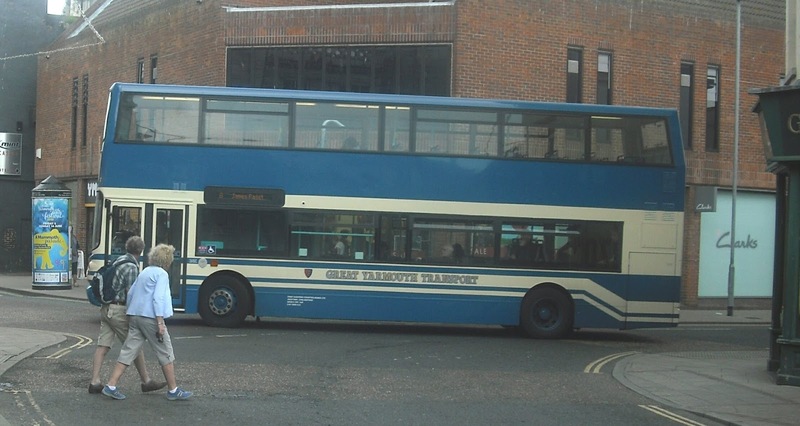 Variation to routes 75/6/7/8 between Ipswich and Felixstowe. To amend route, stopping places and timetable from 30/8/15. Observers will note some new service numbers in that list, including the 78 and 64X. As soon as I receive details of these services I'll publish them. It also seems that the Sunday service to Woodbridge has once again bitten the dust. I fully expect more VOSA activity over the coming days and weeks. As they go up I'll publish them here. It would appear that Yarmouth depot now has two incrediby photogenic buses. THREE I mean three - sorry Chris and Danny! Not only is there 33423 which (I'm whispering this) might not now be repainted into X1 livery - not confirmed so no champaigne yet - but also now there is 59. I wasn't sure about it until I saw it in the flesh yesterday at James Paget. Not much makes me go wow these days but 59 did, and if she is kept in this condition will be turning heads for a long time. Must mention the driver who made sure I'd got my pic before driving off. Today I saw her at Market Gates and a lot of heads were also turning. Unfortunately one of the pics got totally bombed by a couple of tourists but the pic is still worth showing. 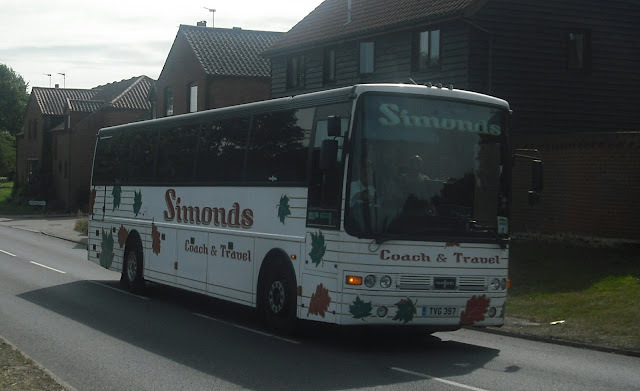 Finally for today while at Southwold this afternoon I finally got up close and personal to a coach from a company whose vehicles I've long admired. Kings Tours of Stanway, Essex, had one of their immaculate Van Hool T916 vehicles on a visit to the seaside town, and an extremely chatty and friendly driver let me have a look around. Quite simply it is spotless. Even the luggage compartments are carpeted! The legroom insiide was impressive, although I'm not sure I'd squeeze into the crew compartment these days! 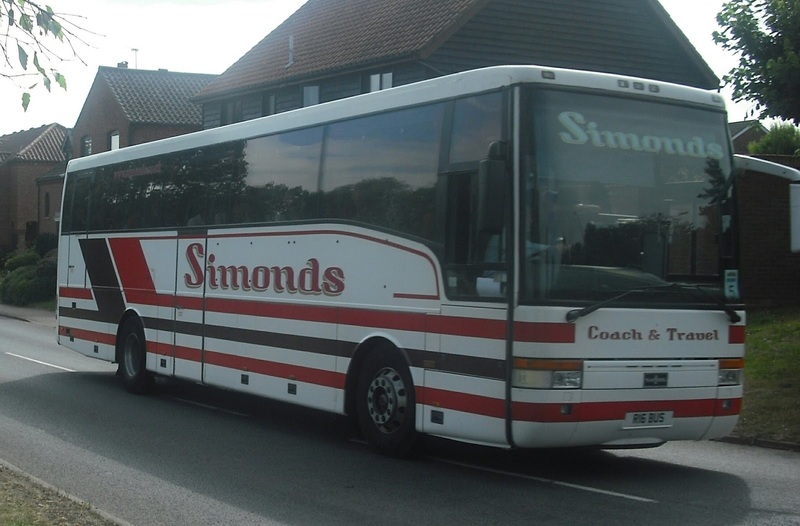 A quality coach and quality driver from what looks a quality company. Tomorrow I will be posting hoping to start a debate comparing past and present, inspired by a Twitter conversation with an old friend earlier. Come back tomorrow to read and take part! Qute a lot to get through today, which makes a change as recent weeks have been quiet. First of all it has been a busy week on VOSA, which many of our local companies submitting registrations for approval. I'll go through them company by company. I am reliably informed there will be more VOSA activity in the coming days so keep checking in for details. I'm also told I won't like all of them! 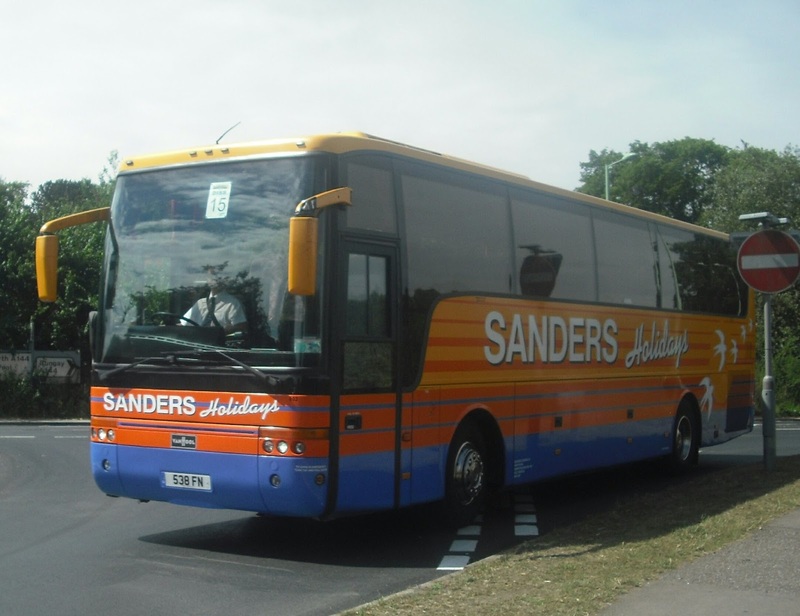 The other pic Chris sent is one of his own buses. Chris owns a small hertage fleet which I'm hoping to do a special on in the coming weeks. S916 CFC in an ex Stagecoach Oxford MAN engined E300, formerly fleet number 22916 which is on long term loan to Nu-Venture. 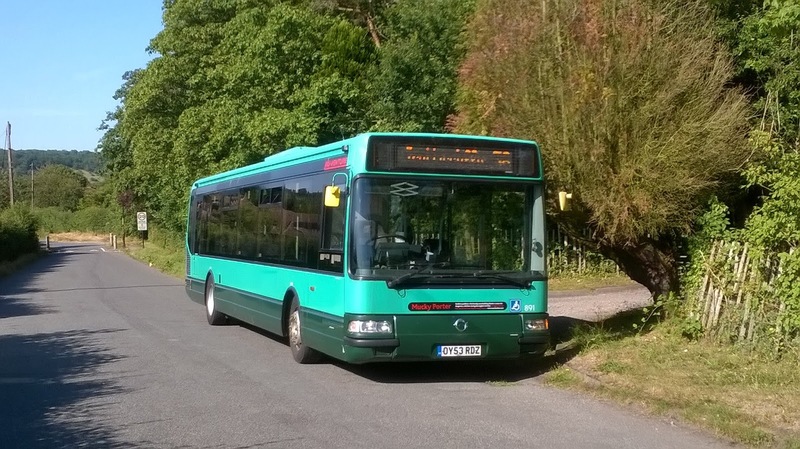 Her regular route is the 316 from Gravesend to Meopham, and Chris rather surprisingly admits that although he owns her he's never driven her. Many thanks for the continued updates, Chris. 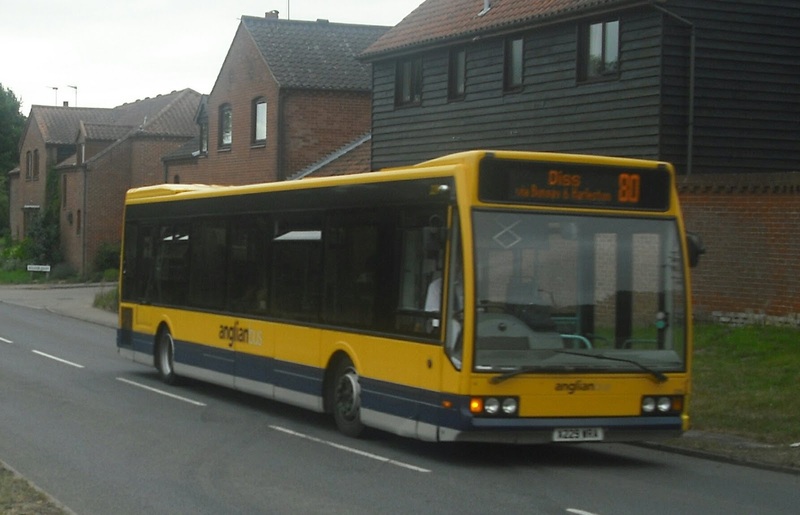 Having cleared the "graveyard" at the bottom of their depot recently, Anglian are now taking withdrawn buses from elsewhere in Go East. Tim Miller sent in these pictures of 3 Hedingham Olympians that are at Beccles awaiting scrapping. I wonder if their gearboxes would be of any use at a certain depot in Yarmouth! Rather sad pictures really as they still look in great nick. Many thanks, Tim. Today saw the first day in service of Yarmouth Heritage ALX400 32059, or 59 as it simply says on the front.. After its arrival in the town yesterday, which had the great and good of the enthusiast world scurrying for pictures I waited until today hoping to catch her in service. I failed. Fortunately Cameron didn't and he has kindly sent in this cracking picture of her I think by Sainsbury in Yarmouth but I could be wrong. 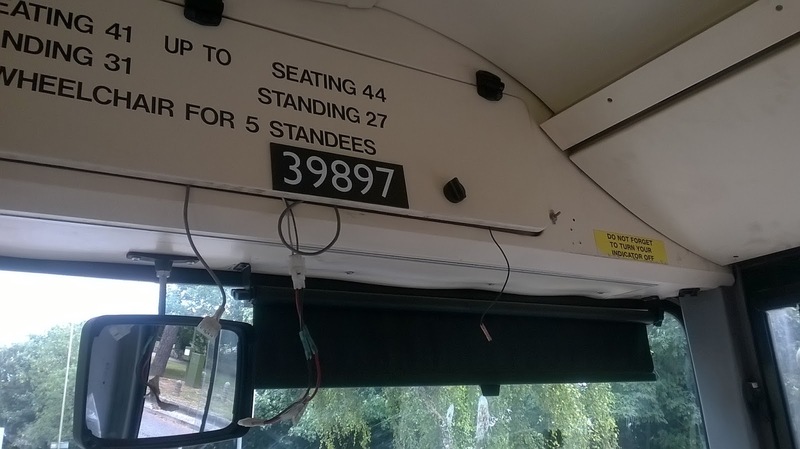 There is just one depressing point about this bus. 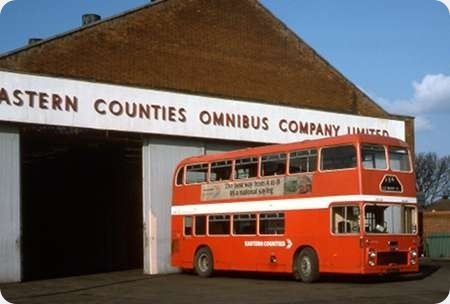 It was intended to put new seating in both 32059 and the Lowestoft Heritage bus, 30888. However the level of vandalism to seats in the towns has reached such a height the decision was made to leave the old hard seats in them. 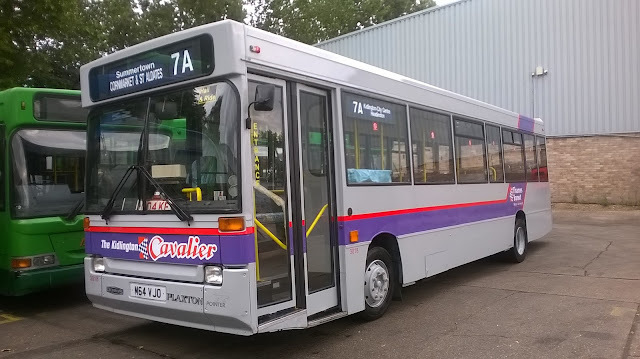 We remember one of the new Streetlites, 47502 being attacked by vandals on her first journey in service so this comes as a sad reflection of the respect that some people have for the vehicles they rely on to get them from A to B, and I cannot criticise First in the slightest for taking that decision. Cameron has also asked me to tell you that he has missed blogging too much and therefore has decided to ressurect Yarmouth Bus Page. He has informed me that there willl be many more pics of 59 tomorrow night, and he will be spending the day on her tomorrow to give a full review with pics tomorrow evening. Welcome back Cameron. I knew you'd be back which is why I never took the link down! Secondly tonight Tim Miller has caught Class 37itis and has sent in another video for your enjoyment of the intiidating Loud Set taken at Haddiscoe. This video has them passing through at speed, as well as a great soundtrack from the return journey. An appetiser at the beginning of the video is a little Class 153 going through. Many thanks, Tim and keep them coming. Over the weekend I'll be going through some other local news and there will be an Agoraline update from Chris Wilkinson down in Kent. As you will all know Tuesday saw the 10th anniversary of the terrorist attack on the London transport network. Three Tube trains and a bus were blown up, resulting in over 50 deaths, hundreds injured and many more lives altered forever. As someone who has known the Underground system all my life, and has driven buses in London I was obvously deeply moved by the events that day. It was somewhat apt that no one else on the train appeared to realise the significance of where we were or what had happened 10 years and 110 mins prevously. Life will go on regardless of what others may do to try and disrupt or ruin it. I carried on to Victoria where I stayed until 1130 and the minute's silence. 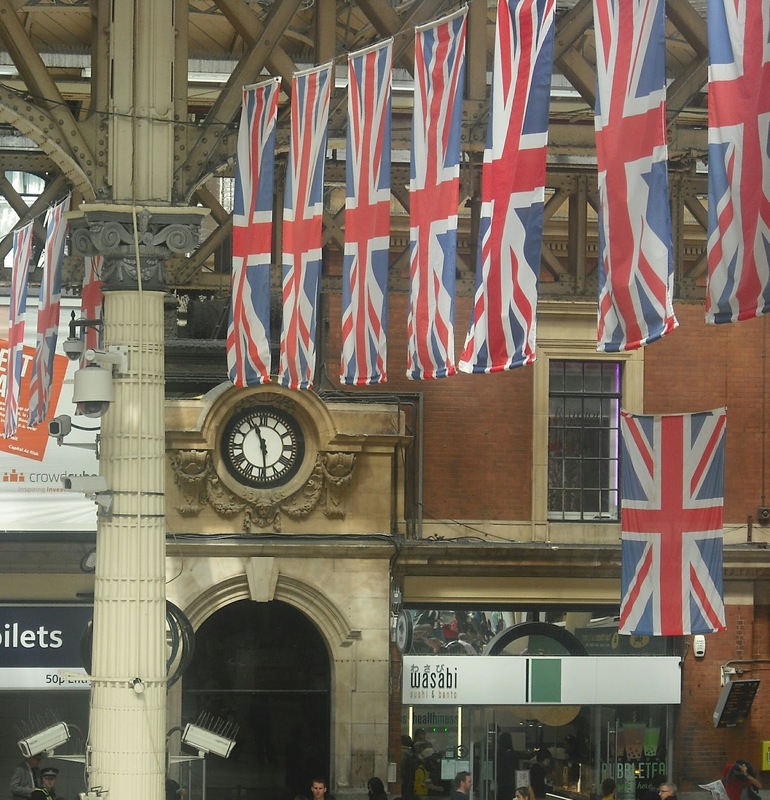 I stood next to two Transport Police Officers on the balcony at Wetherspoons which gave the perfect view of the station clock surrounded by Union Jacks. After returning from my appointment I jumped on a 73 to Marble Arch where it was my intention to ride a number 30 to the place where 10 years ago an ALX400 on the route was blown up. Unfortunately, though, there was a huge gap in the service in the 30's with no buses for over 45 mins, so that plan had to be aborted. 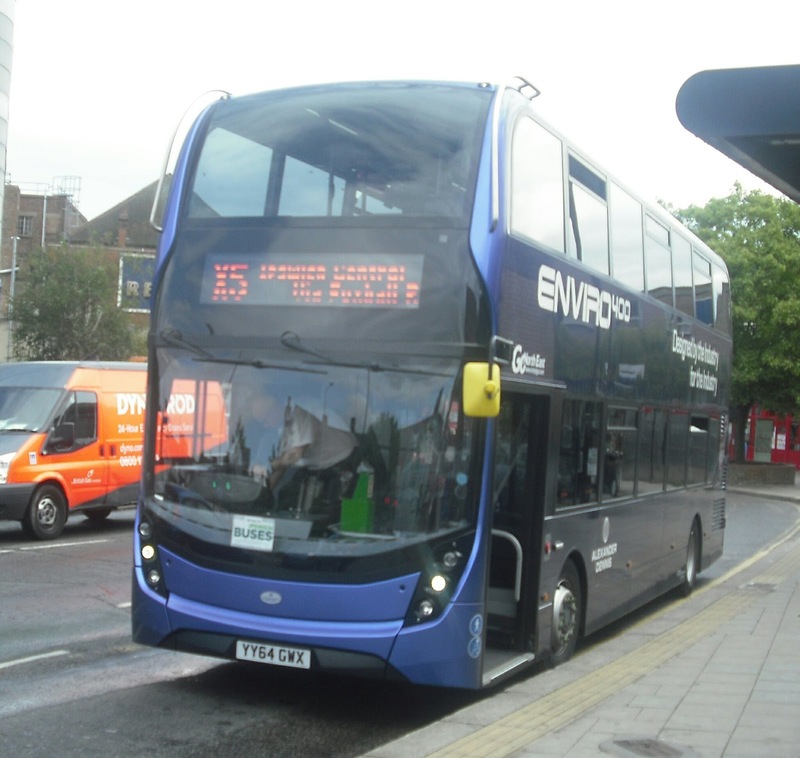 However, I did get a picture of one of Tower Transit's E400's now operating the service. Many of us have been involved in public transport all our lives. 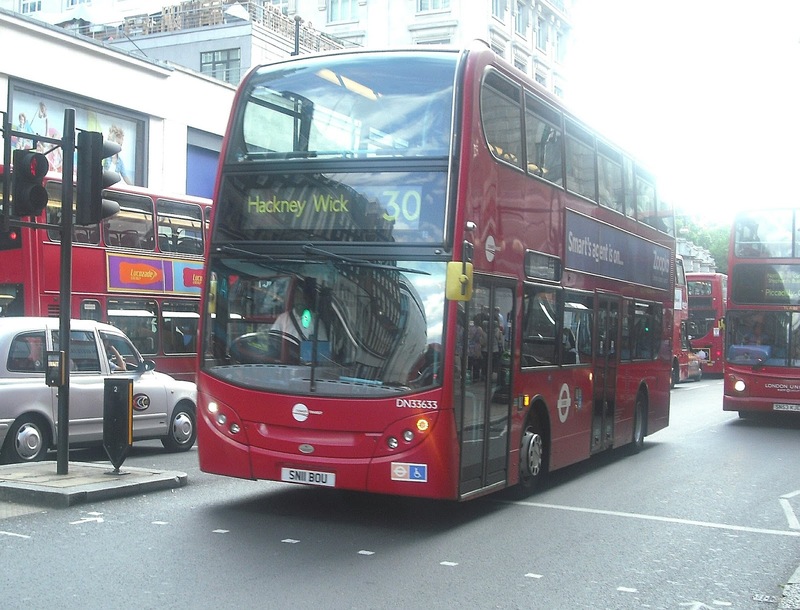 Many of us use public transport every day and it is easy to take our safety as granted. On that day ten years ago everything was normal until 0839 when normality was literally blown off the rails. It is testament to the determination of the British people that normality returned quickly, and ten years on it was as though nothing had ever happened. The trains were running, the buses were moving, people were hurriedly going about their business. Tourists were there in their thousands, taking pics of landmarks, pigeons, even buses! The traffic was awful and cyclists were still jumping red lights. It was a normal day in London. But for a few minutes we remembered those, both living and dead, whose perception of public transport was changed irrevocably on 7th July 2005. It could have been anyone of us, and for that reason we should and can never forget.